Got a nice suprise the other day. The chef came back from cuti yesterday and brought some 'Kijang meat' from his kampung. Now, how he got hold of the meat i don't know and i don't want to know. So yesterday, we had this 'kijang meat' for lunch yesterday. 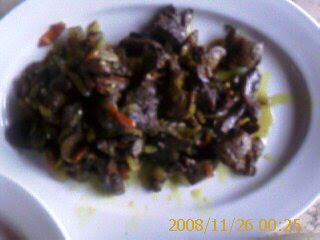 I had never tasted 'kijang' before.. wild deer meat i tasted a few times... but not 'kijang' and 'napoh'. It was quite interesting the taste of the meat. It was tender and does not need any tenderiser. It was only fried with garam and kunyit but it was quite good. Was still juicy also. Not bad for my first taste. My two vices.... or is it sins... haha.. Nicotine and caffeine. Can't live without 'em. 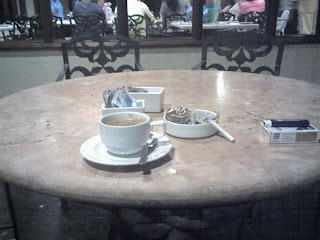 First thing in the morning has to layan a cuppa of fresh brewed roasted arabica with a few sticks of marlboro Lights. Been meaning to quit smoking but you know us smokers... never can trust our promises to either cut down or stop smoking.Even now, while writing this.. i'm enjoying a cup and a few sticks, puffing like na chimney to pollute the clean kenyir air. What the heck, it's too clean here anyway. The air i meant.. haha. It happened more than two years ago... but, what the heck... i'm gonna brag about it nonetheless. This was the biggest fish that i had caught in my fishing career. Five kilograms of Belida. None that i had caught so far has beaten the record. 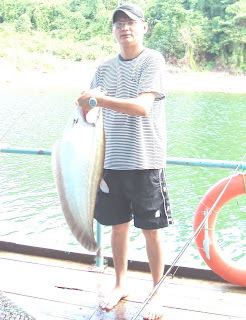 This was caught in June 2006 at Sg. Mandak in Tasik Kenyir. That was before i migrated to Kenyir and worked here... ever since.. didn't have much time for fishing. Odd isn't it... i got more time to fish when i was working in the city compared to the time i'm working in fishing heaven. Now, belida is a fish which has is full of those small tiny bones. The best way to eat this fish is by pouring hot water all over the body and then scraping the flesh with a fork. Then u mince the flesh and turn it into fishballs. What u want to do with the fishballs is up to you, i rather like it fried compared to steam. The flesh is white and tastes quite nice. If you want to cook it any other way, be prepared to fight with the bones, be careful though! you don't want to end up in the hospital with the bones sticking in your throat.